Transfusion-related acute lung injury (TRALI) is a serious blood transfusion complication characterized by the acute onset of noncardiogenic pulmonary edema following transfusion of blood products. Acute pancreatitis-associated lung injury (acute pancreatitis associated lung injury, APALI) is the most common and severe complication in patients with severe acute pancreatitis complicated with multiple system organ failure. Rapamycin is a new macrolide immunosuppressant. The recent report has shown that rapamycin could inhibit the inflammatory reaction induced by NF-B activation and neutrophil, but till now, the effect of rapamycin in acute lung injury caused by blood transfusion and acute pancreatitis is unknown. 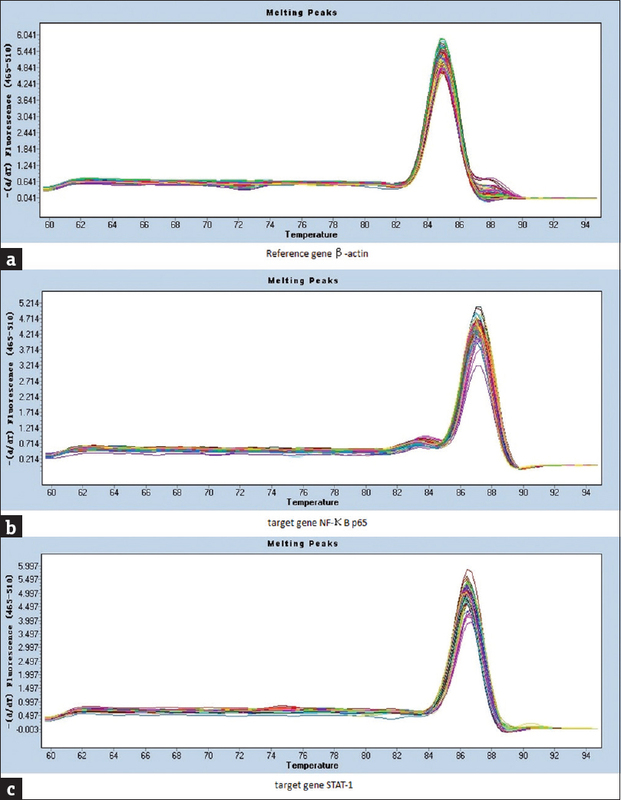 The amplification curves of real-time fluorescent quantitative PCR showed obvious “S” type [Figure 1]a, [Figure 1]b,[Figure 1]c. The melting curve showed no impurity peak and no abnormal broadening of the main peak occurred [Figure 2]a, [Figure 2]b, [Figure 2]c.
To observe the effect of rapamycin on gene expression of nuclear factor-κB (NF-κB) p65 and STAT-1 in Sprague–Dawley rats with acute lung injury. The animal models of TRALI and APALI were prepared using Sprague–Dawley rats. Histopathological examination of lung tissues validated acute lung injury. Gene expression in NF-κB p65 and STAT-1 was detected by real-time fluorescent qualification RT-PCR on the control of beta-actin (housekeeping gene). The gene expression of NF-κB p65 and STAT-1 in TRALI and APALI group was downregulated to a different extent (P < 0.05), and APALI group decreased more than TRALI group (P < 0.01). 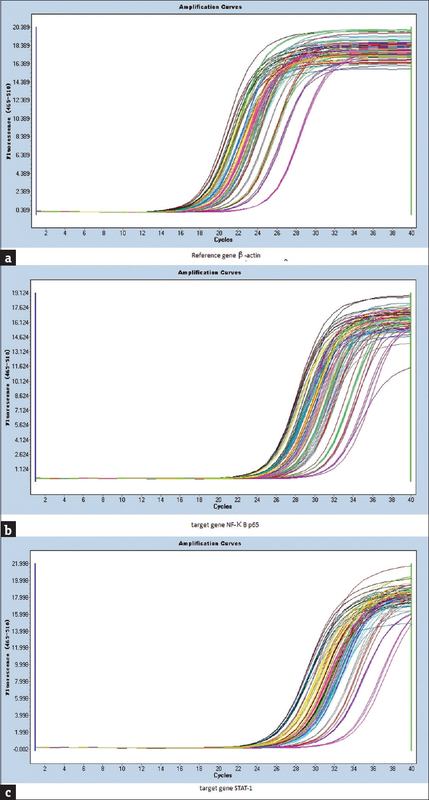 The gene expression of NF-κB p65 and STAT-1 in rapamycin intervention TRALI group decreased more than TRALI group (P < 0.01), while rapamycin intervention APALI group did not decrease significantly compared to APALI group (P > 0.05).